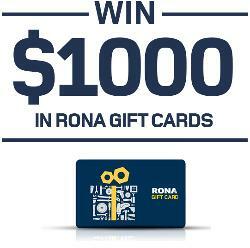 Contest: Rona - “$1,000 Customer Satisfaction Survey”. Rona - “$1,000 Customer Satisfaction Survey”. Prize: There are twelve (12) prizes of $1,000 in RONA or Réno-Dépôt gift cards, accepted in all participating RONA or Réno-Dépôt stores. The total value of all 12 prizes awarded in this Contest is $12,000. Statistics: This contest was opened by 127 and entered by 1 ContestChest.com members. 1% of those who opened the contest, entered it.